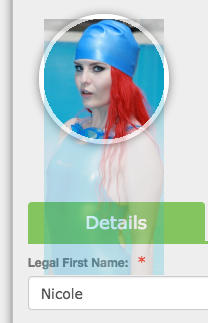 What size should I make my member and coach photos? The short answer is 120x120 pixels for members in the profile; this will display nicely for coaches on the Coaches page as well. This is the minimum you should size any photo. The long answer depends on the aspect ratio of the photo; that is, its width vs. height. If you load a large photo into a member's profile, if it's perfectly square then it will shrink to fit in the circle. 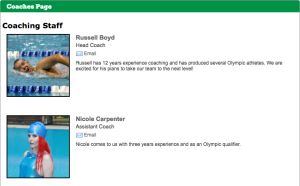 On the Coaches page it will display at a maximum of 252x252 pixels. This is very large and we don't recommend it. If a photo is rectangular and taller or wider than 120 pixels, it will shrink it to fit within the circle in the Member profile. For portrait oriented photos like the one to the right, it will shrink it until the left and right edges of the photo fill the circle and display the top part, thereby cutting off the lower part. For landscape oriented photos like the one below, it will center it horizontally in the circle and shrink it down until the top and bottom edges of the photo fill the circle, thereby cutting off the sides. If a photos is smaller than 120 pixels wide or tall (again, not recommended), it will expand the photo until it fills the circle, basically doing the same as the above but expanding instead of shrinking. On the Coaches page, it will display the entire photo, resizing as needed to ensure it's no wider than 250 pixels, and no limit vertically. Below is what it looks like with the extreme photos from above (left) and photos sized to 150x150 pixels (right). We encourage you to consistently size all photos the same to maintain a professional look, whether that is square, portrait or landscape oriented, and avoid wide or tall extremes.